Click here to book your skis now ! 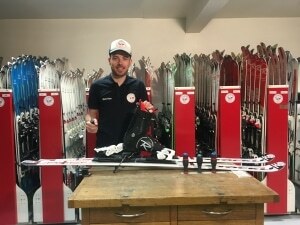 Quality ski equipment, waxed and sharpened ! We take care of our rental skis ! All our snowboards and rental skis are overmoulded, sanded, sharpened to ceramic, wrought to stone and waxed after each exit. The ski boots and helmets are all cleaned, disinfected, dried and polished after each hire. We also take care of the maintenance of your personal equipment ! 9 times French champion, 2 Olympic Games. 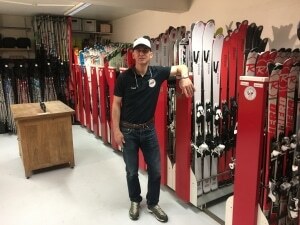 Manager of the store that bears his name, Yves has 30 years of experience in ski hire in Morzine. Skiman for more than 15 years, Francois can take care of material like nobody in Morzine ! Ski repair, race preparation, bootfiting, he knows how to do everything. 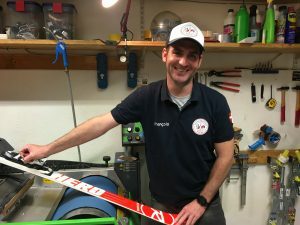 Ski and snowboard instructor for 15 years at the Morzine’s ESF ski school, Bastien will know right away which material best suits your level. I learned to ski in Morzine on skis from home … never disappointed, always well received, I arrive Sunday … To Sunday of the blow ! Great!!!!!! Really nothing to say again thank you to the whole team !!!! Great welcome, great choice of items …. I highly recommend !!!!! Good material at satisfactory price! I recommend! Friendly staff and very good advice I would stay again ! Best price and quality ! Family and friendly shop with quality services and products ! Super friendly, a qualified team !!! I recommend !! Very pros .. Warm and friendly welcome. Very good shop, very nice home. The top ! Yves Tavernier Sport is not only a ski rental shop, but also a shop, in the heart of the city. Liliane, Emilie and their saleswoman are waiting for you to help you in your purchases. Find a wide selection of ski suits, ready to wear and accessories among our many brands to satisfy To the tastes and colors of all! Join us on Facebook to discover the latest in-store products and collections! Enjoy 5% extra discount code !!! Valid on all ski and snowboard rentals. Your email will not be shared or sold !